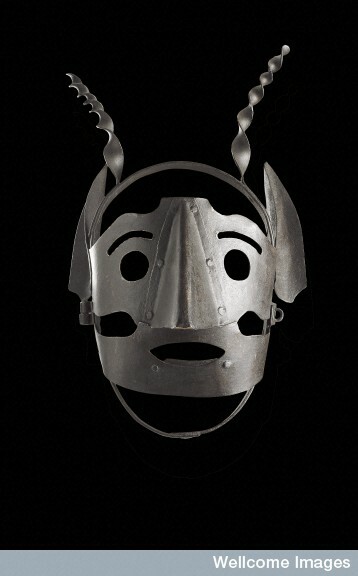 "A ‘Scold’s bridle’ is a fearsome mask. It fits tightly onto the head. This example is decorated with horns. It has an over-sized nose and ears. A scold was defined as a “rude, clamorous woman”. 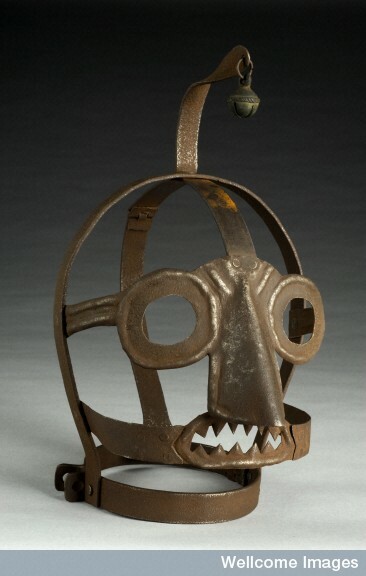 The bridle was a punishment for women who spent too much time gossiping or quarrelling. A local magistrate normally allocated the punishment. The custom developed in Britain in the 1500s. It spread to other European countries, including Germany. It was impossible to speak while wearing the mask. It was a punishment in workhouses until the early 1800s. The top example is believed to have been found when the Vilvorde prison in Brussels, Belgium was rebuilt in the 1770s. The bottom example has a bell on top to draw even more attention to the wearer, increasing their humiliation." From the Wellcome Images Collection.